I've been to Savannah, Georgia once in my life and I found it both charming and beautiful. The people were delightful, even if the weather wasn’t, and the history of the city is enthralling. Founded in 1733 by British General James Edward Oglethorpe as a buffer between His Majesty’s colonies and Spanish Florida and French Louisiana, she is full of wonderful sights and delicious restaurants. Her seafaring legacy is rich as well and, of course, that means a few piratical legends. Given that Jean and Pierre Laffite were two separate men, probably never did more than glance over the rail of a ship at Savannah and were neither of them ever married, committing that snippet to paper does a deal of harm to any writer’s credibility. That said, Belanger – who is “one of the world’s most visible and prolific paranormal researchers” according to the bio on the book jacket – tells us that he has spoken to people who have had unusual experiences at The Pirates’ House. As a number of these episodes seem to involve rum, it is no wonder that people are convinced the ghost haunting the restaurant is a pirate. Other “spirit related” incidents at The Pirates’ House included glasses suddenly exploding or filling inexplicably with Spanish moss. Does, as Belanger asserts, the “… spirit of Flint in all his menacing glory still walk the Pirates’ House”? It’s hard to say. 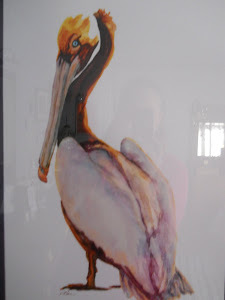 What I will say without question is that, given the handsome decor and mouthwatering fare available at the restaurant, as the pictures from Savannah for 91 Days attest, I would happily haunt the place were I an old, chain-rattling seadog. With that, Happy Halloween Brethren. May your spirits be joyful and may you always have more rum. 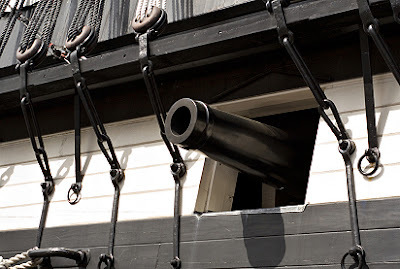 The gun to which boys serving in the Royal Navy were tied or 'married' when being whipped. On some ships it was superstition that if the boys were not whipped on a Monday, there would be no good winds the following week. To 'hug' or 'kiss the gunner's daughter' thus meant a whipping. When 'married to the gunner's daughter' for a flogging, the miscreant was tied to the four deck rings which held each cannon in place. As the sailor was tied to the gun barrel, the saying 'you've got me over a barrel' comes from this time. Sailors were whacked with a rope's end on the gun deck, where the ceilings were only a maximum of four feet six inches. For more serious offences, requiring enough room to 'swing a cat' of nine tails, the punishment was carried out on the main deck. The English word “devil” originated with the Greek word diabolos. This word in Greek did not mean some imp or demon but a slanderer (dia – across combined with ballein – to throw). The act of slander in Ancient Greek culture, and later in Rome as well, was so heinous that the word quite literally became demonized. 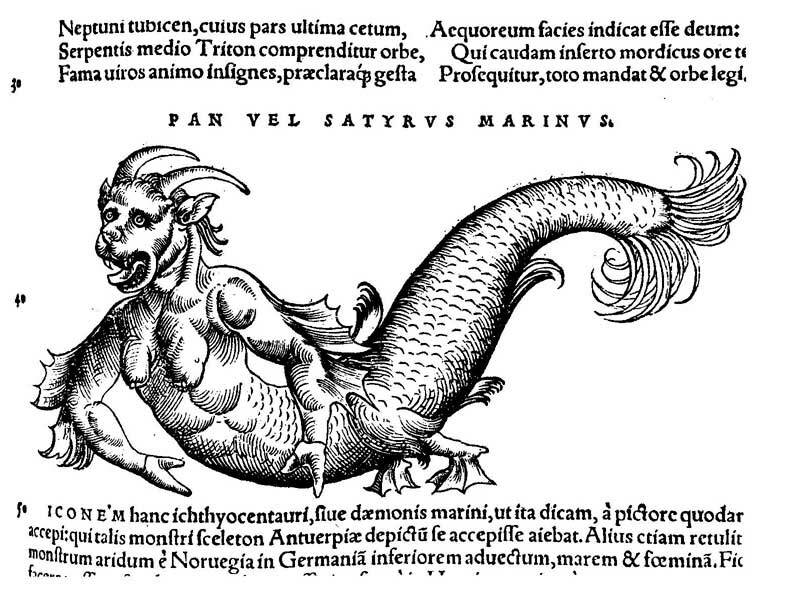 By the medieval period it had morphed into the Middle English devil, a limb of Satan and later still Devil, Satan himself. Sailors, much like any group of people who live and work in hostile and potentially deadly conditions, tend to both laugh at and fear evil. Use of the word “devil” and calling upon the Devil are not uncommon at sea, or at least they weren’t. When times are really tough, the essence of evil may be more helpful than the essence of sanctity. And, aside perhaps from Saint Brendan, there has rarely in any history been a saintly sailor. Devil bolts are those with false clenches. As The Sailor’s Word Book notes, they were often used in contract built ships. They were ill thought of among blue water seamen and usually replaced fairly quickly once the ship was afloat. A devil’s claw is a very strong split hook used for grasping chain cable. Devil is priming made by wetting and bruising black powder. Caulkers called the water line on a ship the devil, probably because it was the hardest part of the vessel to make air tight. Devil is also used in weather signals and signs. Devil’s smiles are patches of sunshine streaming down through dark clouds, a sure sign that better weather is on the way. Sometimes the officer in charge – and particularly the captain – was said to have “the Devil’s smile”, considered a good sign that a prize might be in the offing. The Devil’s tablecloth is a particular portend of a south-easter off the Cape of Good Hope, where condensation from the impending storm forms a patch of fleecy cloud at the top of Table Mountain. Devilry is the act of wanton trouble that is only inches from crossing over into crime. Sailors ashore, particularly after a long time at sea, were notorious for drunken devilry. Men said that there was the Devil to pay and no pitch hot when there was necessary work to be done and no one stepping up to do it. This was also a phrase that indicated impatience with no outlet; rather an old sea-going form of “all dressed up with no place to go”. Of course, it probably goes without saying that a sailor can all too easily be caught between the Devil and the deep blue sea. That term’s origin has been a source of debate for years but everyone understands its meaning well enough as we’ve all been there in one way or another. Finally, in the very worst of circumstances and particularly in a vicious storm, an offering might be made to the Devil. In a gale that had torn his fore and main topmasts away, Charles Ellms tells us that the pirate Captain Lewis “… tore off a handful of hair and throwing it into the air used this expression, good devil, take this till I come.” Lewis must have had the Devil’s ear; despite the loss of his topmasts, he overtook the prize he was chasing. Out in Boston Harbor there sits a tiny speck of an island that, at first glance, almost appears to be man made. Known from about 1636 as Nix’s or Nixes Mate, the island is the site of a pyramid beacon run by the Coast Guard and on the U.S. National Register of Historic Places. In the 17th century, the island was large enough to mine for ship’s ballast, graze sheep and unload smuggled goods for reloading onto less suspicious vessels. Probably because of its continued use by smugglers and pirates, the place became notorious; from the time the island was granted to John Gallop in 1636, the good folk of Boston used it as a place of execution for those who committed crimes on the high seas. Many legends have grown up around the fascination with piratical doings and the demise of scurvy seadogs on the island. One of the most popular stories explains the name of the island as well as why it is now just a speck of earth in Nubble Channel. 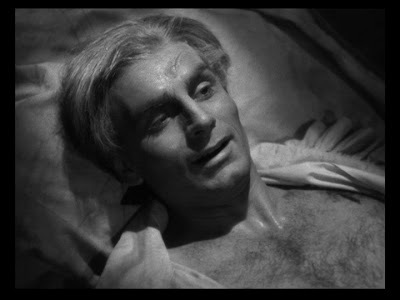 It seems that one Captain Nix put out to sea and was killed mysteriously one night in a violent storm. The next morning, the crew found their First Lieutenant – Nix’s mate – soundly sleeping with blood on his shirt. Assuming the worst, they clapped the man in irons despite his protests of innocence, and turned back toward Boston. The First Lieutenant was tried and found guilty, although he continued to tell anyone that would listen that he had not done the bloody deed. He was rowed out to the island and led to the gallows. There he made a promise to the people of Boston about the place where his corpse would hang as a warning. The island, he said, would be washed away to nearly nothing by the sea as proof of his innocence. With that warning on his lips, he died. Within a decade, the Lieutenant’s prophecy had come true and the people of Boston named the little island Nix’s Mate in his honor. In fact, this story first appeared in 1883 in a purported historical entitled King’s Handbook of Boston Harbor by M.F. Sweetser. It is a charming tale, of course, but probably pure fiction. No one seems quite sure why the island is called Nix’s Mate and the continued use of its rock for ship’s ballast throughout the 17th century insured that it would errode with wind and tide to its present size. 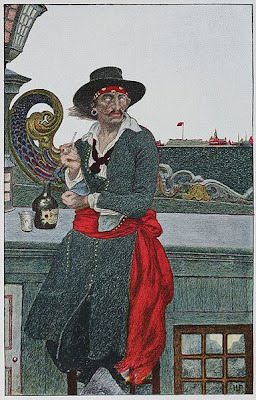 The most famous pirate to swing in the sea breeze on Nix’s Mate was William Fly, whose story is curious enough to deserve a post of its own. Hanged in July of 1726, Fly went to his death with such steadfast obduration that he impressed that bitter witch hunter Cotton Mather himself. Local legend has it that Fly’s spirit continues to cling to the place where he proclaimed not his innocence but his conviction that piracy was born of the harsh treatments allotted men in the merchant service. Treatments Fly referred to as “bad usage”. It is said that blue lights are seen hovering over the little pyramid beacon at Nix’s Mate on warm summer nights. They dance about in the dark air but disappear when a vessel pulls in for a closer look, flying up like embers out of a fire. 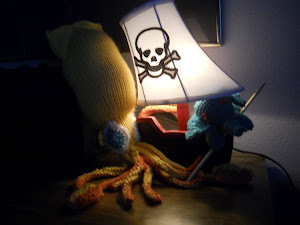 True or no, all sailors love a good ghost story and they are always so much more believable when the mate in question was put to “bad usage”. Mistress Agnes Cowtie was the kind of business owner that was more typical in her era than our Victorian ancestors would like us to believe. Though she was married to a respectable merchant named George Blak, she herself ran a shipping business that traded with England, Holland and France from the port of Dundee, Scotland. She had at least two grown sons who worked aboard her ships, possibly as officers but certainly as her representatives in trade in foreign ports. It was not at all unusual for Mistress Cowtie to be standing on the dock at Dundee, waving off her carrack Grace of God, as it headed out to the Netherlands. 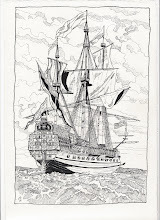 Was Agnes anxious as she watched that ship sail off laden with both cargo and cannon? Most probably; the year was 1562 and the threat of English piracy surrounded the British Isles. More distressingly for merchants like Agnes and George (as noted here), this piracy went virtually unchecked. Even entreats from Queen Elizabeth herself could not pull freebooters away from their lucrative employments. Grace of God was armed against such attacks and had, it seems, a relatively uneventful voyage to the port of Veere in the Netherlands. In her book She Captains, Joan Druett tells us that the sons of Agnes Cowtie were probably well known in that port city and may very well have been welcomed into some of the finest homes. 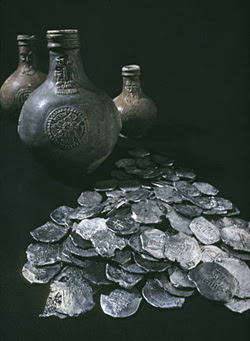 They traded their merchandise for sundry items but Druett notes most particularly “6 cast pieces and 16 small pieces of ordinance”. Cannon were just as profitable in such times as finished cloth. With their business done the Cowtie boys steered their ship away from Holland and may have been headed to the Bay of Biscay, perhaps for a stop around the Gironde to load up on wine. They would never make their destination. Their ship was attacked by a group of English ships. This little flotilla seems to have been led by those notorious pirates from Poole, Captain Clynton and Captain Purser. Grace of God put up a fight in which both of Agnes’ sons were killed. Probably shortly thereafter, she struck to her attackers and the horror really began. The pirates boarded the carrack and, in a fashion that would become standard among freebooters, took their aggressions out on the crew that had the temerity to defend themselves. Under the guise of discovering where the Cowties had hidden the hard specie, the pirates set into the most brutal of tortures. Men had splinters of wood shoved under their fingernails. The wood was coated with tar before being set ablaze to burn whatever flesh it touched. 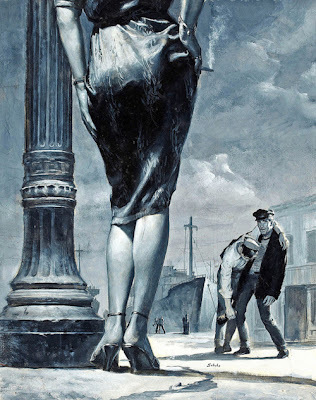 When this had no effect, the men’s hands were dipped in hot tar and set ablaze. Fingers and in one case a whole hand to the wrist were lost. They put a rope around another one’s head and twisted it so tight with a wooden billet that the blood leaped from his mouth, nose and ears. Eyes would be forced from their sockets, as Druett notes “…bulg[ing] out … like eggs.” This simple but terrible operation left seamen both blind and deaf. Eventually the madness subsided and, almost miraculously, some of the pitifully abused crew of Grace of God managed to make their way back to Dundee despite the taking of their ship as prize. Agnes Cowtie, doubtless both revolted and enraged when she saw the men she called her “especial mariners” and heard of the senseless deaths of her sons, went ballistic. She began a campaign of appeal to the highest officials and nobles in Scotland claiming the need for redress for not only herself but for the loss of her sons and the inexcusable state of her wounded men. In one particularly touching letter, she and George lamented being “… brought to such extreme wreck and misery by invasion of English pirates, their bairns and servants slain…” Bairns, of course, being the affectionate Scottish word for children. It may have been that Mistress Cowtie’s timing was impeccable but more likely her shrewd choice of ears to chew and her particular indignation worked more thoroughly than any previous objections. Her petitions went as far as the throne; King James himself wrote to Queen Elizabeth entreating her as “You’re most loving affectionate brother and cousin” to put a stop to the unconscionable predations being perpetrated by her subjects. And she did. The English crown, in most unusual fashion, paid not only Agnes Cowtie redress for her lost ship and goods, but also allotted money to her maimed and crippled men for their loss of livelihoods. Whether this satisfied the Goodwife or not, history does not say, but one hopes that other freebooters learned this lesson: don’t mess with Mistress Cowtie. In 1655 the Dutch East India Company was a thriving commodity. Running ships from Holland around the Cape of Good Hope into the Indian Ocean to what is now Indonesia and back again was old hat, so to say. Doubtless, however, no one took it for granted. The ocean, then as now, was a vast and powerful thing that could swallow whole ships, their cargoes, crews and passengers alive. Never being heard from again was a very real possibility. Surely Captain Pieter Albertszoon knew that the worst could happen as his ship, Vergulde Draeck, left port for the East Indies in October of that year. A leader cannot dwell on the potential for failure, however, and it is a certainty that Albertszoon intended to reach what was then known as Batavia safely. His ship, whose name translates as Golden or Gilt Dragon, carried trade goods for Company use, eight chests of silver coins, provisions for one year and 193 souls including crew and passengers. All signs seemed favorable and Vergulde Draeck rounded the Cape in March of 1656. Almost exactly one month later, Albertszoon was lost thought he probably did not know it. He was closer to the western shore of Australia than to India when his ship hit a reef that quite literally shattered her hull north of the modern city of Perth. Panic ensued as the roaring ocean around the reef sucked people, goods and finally the ship down to the murky depths. Of the 193 souls in Albertszoon’s charge, 75 managed to make the beach. There can be no doubt that they gathered together, half drown and dripping wet, to watch dumbfounded as their wooden world was swallowed by the sea. Albertszoon kept his head, however, and began to organize the living immediately. 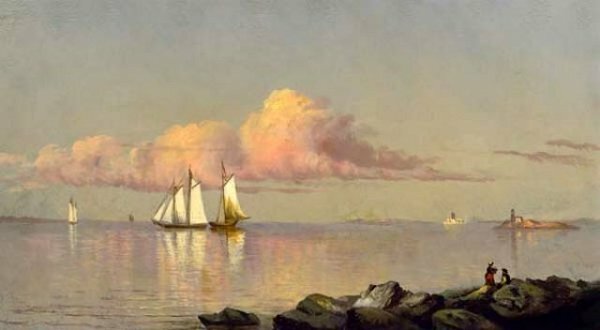 He had the good fortune of a sturdy and fast-thinking First Lieutenant named Abraham Leeman who had managed to salvage a few provisions as well as Vergulde Draeck’s only boat. The situation was perhaps more dire than it would have been at another time of year. With winter on its way, storms would batter the coast and ships passing by – if any – would probably not steer close enough to shore to see signal fires or other markers left by the stranded. It was quickly decided that Leeman would need to hand-pick a small crew, gather what provisions he had salvaged and take the longboat out on the treacherous journey toward Batavia. Albertszoon would stay with the remaining survivors who would doubtless move inland to find water, food and shelter. Leeman and seven crewmen set out for Batavia perhaps only a day or two after the wreck of their ship. They reached their destination in remarkably good condition on June 6th. The Company’s response was almost immediate; two ships, Goede Hope and Witte Valk, were dispatched to the coast of Australia to search for survivors. In an unfortunately hapless adventure, both ships were battered by relentless weather and high seas. Upon sighting land in the general area where Vergulde Draeck was thought to have gone down, Goede Hope sent in a boat. When the boat and its eleven-man crew did not return, another boat with eight men aboard was sent after them. This was dashed to bits on the rocky shore with a loss of all hands. With still no word from or sighting of either the rescue party or the Vergulde Draeck survivors, Goede Hope and Witte Valk turned back to Batavia. They arrived in mid-October. Other ships on their way home to Holland were instructed to call on the fatal coast and check for any signs of life. Repeatedly, they found nothing, although just how thorough their searches were remains unknown. Finally, the ships Waeckende Boei and Emmeloort were dispatched on the 1st of January, 1658 with specific orders to make a sweep of the treacherous Australian coast. The captains of the two ships had a falling out on their way, and they separated. Both were off the coast by February but it was Captain Volkersen of Waeckende Boei who sent a party – led by none other than Abraham Leeman, First Lieutenant – ashore. The men found signs of human encampments, including planking possibly from the wrecked ship, but there was no sign of survivors. Leeman and his search party went back ashore but foul weather prevented them from returning to their ship. Despite the sighting of more than one signal fire, Volkersen concluded that his men had been lost on the reefs and turned for home. Leeman was left with no choice but to once again make the almost impossible journey to Batavia in an open boat. He and his fourteen-man crew set out on April 8th; they arrived at their destination a month later. This crossing had not been as successful as the last. Only five men, including Leeman, survived and all were starving, dehydrated and horribly sunburned. Rumors of possible cannibalism aboard the boat were quashed immediately by the Company. No further search parties were sent to find the lost victims of wreck and marooning. What became of them remains a mystery to this day. The only tantalizing hint was a chance find, made by a young boy inland from Cape Leschenault, of silver coins dating from between 1619 and 1655. These were found in 1931. It is probably reasonable to imagine that the survivors of both Vergulde Draeck and their would-be rescue party from Goede Hope succumbed to injuries, disease, starvation and exposure. Most of all, it can be imagined, they would have given in to the hopelessness of being lost in an unfamiliar wilderness with no reasonable way out. The Vergulde Draeck wreck was rediscovered by spear fishermen in 1963 and, despite unfortunate poaching by treasure hunters, many of the artifacts are now on display in the Western Australia Museum in Fremantle. As a curious aside, a rather conspiratorial theory of the collapse of our modern economy via the U.S. dollar is known as the Vergulde Draeck Omen or, yet more ominously, the Vergulde Draeck Triple Witching Condition. Find that delightful scenario here and read more about the Vergulde Draeck disaster at VOC Historical Society. My current schedule is a little off, Brethren, but I did want to kick off Triple P's third annual Horror on the High Seas week so that we can get a full seven days under our belts, so to say. No new post today but lets start things off right with my dear friend House in Rlyeh's gripping review of the horror classic The Ghost Ship generously gifted to Triple P for her second anniversary. Grab your lunch, sit back and enjoy. Then click on the Horror on the High Seas label below for yet more terrifying flashbacks. Tomorrow, something new: the mystery of the lost Vergulde Draeck. While Hollywood would have us believe that high born Vikings were sent to Valhalla on flaming ships that were set adrift in glacier-fed fjords, reality is somewhat different. 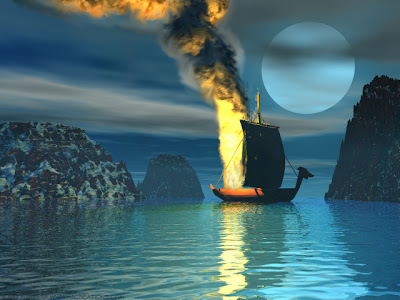 In fact, some of Viking nobility were put to rest aboard ship but the ship was buried rather than immolated. Such burials were rare, ships being expensive articles with more value to their community in use than in the ground, so finding one is a bit of an archaeological dream. That is just what happened last summer, however, in a wee corner of Scotland known as the Ardnamurchan Peninsula. There, according to this article from CNN, a team from the University of Manchester found a 1,000 year old Viking burial complete with boat. The gentleman buried in his vessel was obviously of an elite status. His grave goods included not only the boat but weapons including a sword and knife, flints, pottery from the Outer Hebrides and bronze jewelry from Ireland. As the article notes, this was a well travelled and well respected man. The area where the unknown Viking was found has been a virtual treasure trove for archaeologists. A Neolithic tomb, a Bronze Age monument and a specifically dated 19th century site have all been found in the area. But, as Dr. Oliver Harris says in the article, the Viking burial is “… the best of the bunch.” Doubtless this is true given the absolute rarity of such a find. The team, led by Dr. Hannah Cobb, plans to return next summer to see if they can discover the Viking settlement that must surely have existed in the area. How long these particular Vikings were in what is now Scotland is always a curiosity and how they lived is even more tantalizing. But for now, the land will revert to winter and the academics will be left to ponder what they have already teased out of the hard ground. Let’s hope more information filters through to us as it becomes apparent to them. Oh, a drop of Nelson's blood wouldn't do us any harm; Oh, a drop of Nelson's blood wouldn't do us any harm; Oh, a drop of Nelson's blood wouldn't do us any harm; And we'll all hang down behind. So we'll roll the golden chariot along; And we'll roll the golden chariot along; So we'll roll the golden chariot along; And we'll all hang down behind. The shortened version of the name Robert gets quite a workout on the water. First off, though, Webster tells us that the word entered the modern vernacular either through the Old French bober, meaning to mock or the Middle English bobbe meaning a cluster, or both. The latter is most closely aligned with one of the 17th century meanings of bob: a cluster of worms attached to a string used for fishing. Through this we have the later meaning which indicates a fishing bob or any round doo-dad that hangs from a sting, cord or chain. The necklace you are wearing may reasonably be called a bob if its pendant is round. By extension, anything glittery and pretty became a bobble. At sea, it probably goes without saying, things in the way of bobs become both more precise and more colorful. One of the most common references aboard a sailing ship is to the bobstay. This is a rope, cable or chain that is used to pull a bowsprit downward toward the portion of the keel known as the cut-water. These are used to counterbalance the stress of the foremast stays which draw the bowsprit upwards. There are also bobstay collars which were originally made of rope but are now generally iron bands used for attaching the bobstay to the bowsprit. Bobstay holes are those close to the head through which the bobstays pass. Bobstay plates are iron plates on the keel to which the bobstays are attached. A bob can be the weight attached to a plumb line. A ship is said to bob out when it bounces and bobs in heavy seas without making any remarkable headway. This is a particularly distressing occurrence for those afflicted with seasickness. Waves bobble when they seem to crash without any specific set or direction as during cross currents or riptides. Bob can also apply to things people do. Shift your bob: move out of the way. Bear a bob: hurry up. A bobbery among the men is a disagreement or argument. According to The Sailor’s Word Book this was used particularly by the Royal Navy in the East Indies and China. 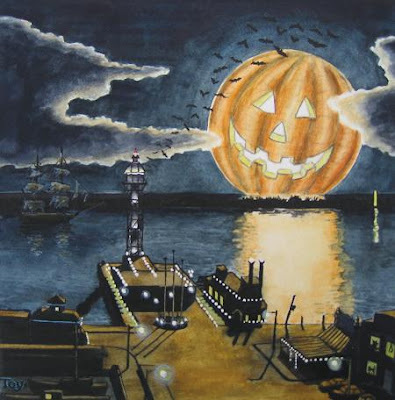 Happy Saturday, Brethren; only two more days until Triple P’s third annual Horror on the High Seas Week begins. The beautiful ring at the header is one of a scant 58 gold and enamel mourning rings minted by Salter of London in 1805. The rings were ordered to commemorate the death of Admiral Horatio Lord Nelson at the Battle of Trafalgar which took place on this date 206 years ago. Distributed to only close relatives, friends and pallbearers at the great man’s funeral, you can bet that Emma Lady Hamilton was not one of the lucky few who received such a treasure. As noted at Marine Antique Digest from which the image comes, the ring bears the initials N and B with a Viscount’s crown over the N and a ducal coronet over the B. The initials represent Nelson’s name and his title as Duke of Bronte which he favored to the point of signing his letters Nelson & Bronte. 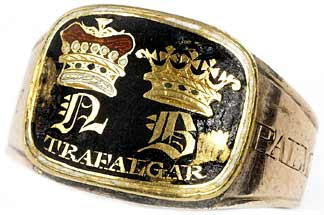 The ring is also engraved with Trafalgar and, along the outside of the band, Palmem Qui Meruit Ferat ~ Let him bear the palm of victory. The inside of the band reads Lost to his Country 21 Oct 1805 Aged 47. This very rare ring was recently sold at a marine sale for $14,455 U.S. and is currently on display at Soho House in London. My thanks to the delightful Susan and Loretta over at Two Nerdy History Girls for the heads up on this in their Breakfast Links of Sunday last. Tomorrow marks the 206th anniversary of the Battle of Trafalgar and the death of Admiral Horatio Lord Nelson. For those of us who live and breathe the history of seafaring, this is a hallowed event indeed. But, though Joseph Conrad told us that exalt was a word that seemed to be created for Nelson, still the Admiral was – in the end – just a man. Examples of this fact are everywhere in the history: his careless treatment of his wife’s feelings, his over-the-top infatuation with Emma Hamilton, his reckless if successful audacity and his sincere affection for his daughter, Horatia. The girl who was named after her father was born on January 29th in 1801. She was one of a pair of twins born to Emma Hart Hamilton as a result of her ongoing and scandalously open liaison with Nelson. Emma, being neither the brightest nor the most steadfast of individuals, felt she could not raise two daughters. 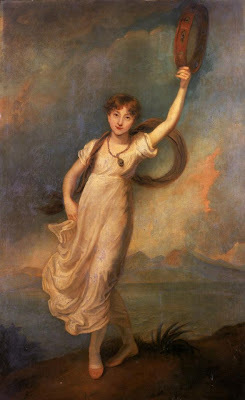 Horatia’s twin was secreted away to a foundling hospital before Nelson returned from a cruise; the girl is rarely spoken of in literature about Nelson, Lady Hamilton, or for that matter Horatia. Horatia was little better off than her abandoned sister, as it turned out. She was initially told that Nelson and Emma had adopted her. Emma recanted this story, telling Horatia her father was Nelson but that she was not the child’s mother. Horatia clung to this fiction for many years, no doubt at the very least resentful of her impoverished youth taking care of a bloated and besotted Emma. Eventually Horatia found happiness, or one hopes so anyway. She married the Reverend Philip Ward in 1822, and the pair went on to have 10 children. Horatia survived her husband and lived to the ripe old age of 80. She seems to have spent very little memorable time with her father but they did carry on a charming if brief correspondence that terminated with one of the last personal letters Nelson wrote. The series of extant letters amounts to four, all of which are available online here (note that admiralnelson.org appears to have the dates of the last three letters incorrect, placing them in 1804 rather than 1805). All four letters were written aboard HMS Victory and have an affectionate tone that brings to mind a father very much missing his child. I was made happy by the pleasure of receiving your letter of September 19th and I rejoice that you are so very good a girl, and love my dear Lady Hamilton, who most dearly loves you. Give her a kiss for me. The Combined Fleets of the Enemy are now reported to be coming out of Cadiz and therefore I answer your letter, my dearest Horatia, to mark that you are ever uppermost in my thoughts. I shall be sure of your prayers for my safety, conquest and speedy return to dear Merton and our dearest, good Lady Hamilton. Be a good girl; mind what Miss Connor says to you. Receive, my dearest Horatia, the affectionate parental blessing of your Father. 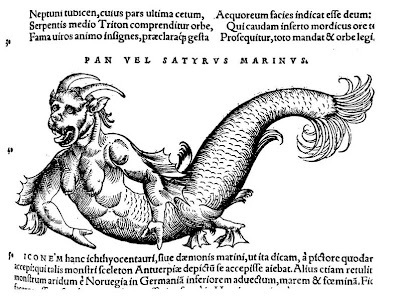 The idea of one-eyed monsters is as old as – if not older than – Greek mythology. The famous cyclopeans who played havoc with Olympian heroes and gods are legendary, of course, and actually survive in modern teen-lit. One of my favorite characters in Rick Riordan’s charming Percy Jackson and the Olympians series of books is Percy’s half-brother Tyson the Cyclops. All that fictiony goodness aside, National Geographic online has confirmed that a shark fetus caught while still inside its mother in the Gulf of California is a bona fide Cyclops. This article indicates that the baby dusky shark, one of a litter of ten otherwise normal fetuses, was indeed an example of a rare, congenital condition known as cyclopia. Also known as synophthalmia, the disorder is documented in 1 in about 15,000 live births in animals and a surprisingly high 1 in 250 embryos. 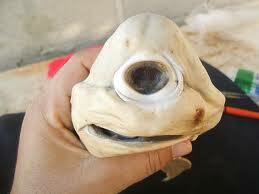 The animals in question include humans although live births of cyclopiad babies are undocumented to date. Once scientists from the Interdisciplinary Center of Marine Science in La Paz, Mexico, determined that the shark fetus was the real deal, they proceeded to request to “borrow” it from fisherman Enrique Lucero Leon. Leon had posted pictures of the odd little fellow on Facebook, which drew interest from the researchers. It’s a humbling experience to realize you ain’t seen it all yet. The life of Sayyida al-Hurra is difficult to discuss. So much of this lady’s life is unknown to us that the temptation is great to fill in the blanks with imagination and fiction. The Brethren know that’s not what I’m about; at least not for the purposes of Triple P. So I will give you the facts that are available and let you decide on the rest. Sayyida al Hurra was born some time around 1485 in or near Granada, Spain. Her family, the Banu Rashid, was Moroccan and when Ferdinand and Isabella brought their war against the Moors to Andalusia, Sayyida and her family returned to Morocco. This was in the early 1490s; Sayyida settled in Chaouen (now Chefchaouen in northern Morocco) with her family. According to Fatima Mernissi’s biographical sketch of her in her book The Forgotten Queens of Islam, Sayyida had a happy childhood but was not allowed to forget the disgrace her family suffered in being ejected from Granada. 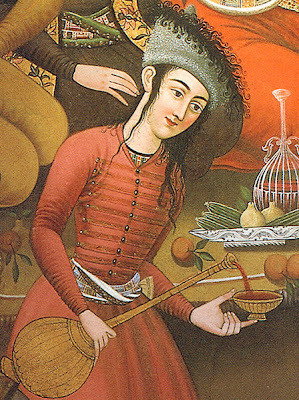 At the age of about 16, Sayyida was married to the Sultan al-Mandri of the city-state of Tetouan. He was thirty years her senior but clearly pleased with his young bride. He raised her to the status of his chief wife and looked to her for advice on matters of state. When he died in 1515, apparently leaving no male heir, Sayyida ascended to the position of Governor of Tetouan and took the title al-Hurra which denoted a woman wielding sovereignty over a state. Around the time Sayyida became governor, Tetouan began trading with Spain and Portugal. The impetus for this move is unknown, but Tetouan did make money on the deal. Sayyida’s savvy leadership brought the attention of the King of Morocco, Ahmed al-Wattasi, who wooed Sayyida from his capital in Fez. When the two married, the King travelled to Tetouan for the ceremonies as Sayyida refused to give up her governorship. At some point between the death of her first husband and 1520, Sayyida developed a hatred for the Portuguese. Looking for a way to avenge whatever slight had been perpetrated by them against her personally, her city-state or both, she contacted the famous corsair brothers known today as Barbarossa. Shortly after her meeting with them, Tetouan began amassing a fleet of galleys and attracting a group of Rais or pirate captains. Sayyida sent her flotilla out in 1520 with specific orders to sink, burn or take as prize any Portuguese ships they encountered. She took a great number of prisoners from this enterprise, making slaves of them and filling Tetouan’s treasury with money from ransoms. For over twenty years, Sayyida al-Hurra was the “… undisputed leader of [the Islamic] pirates in the Westen Mediterranean”, terrorizing Christian shipping there while the Barbarossa brothers ruled the Eastern Mediterranean. Perhaps her most famous raid is documented, again according to Mernissi, in Spanish government papers dating from 1540. Sayyida’s pirates went ashore on Gibraltar taking both loot and prisoners and forcing the Spanish government to negotiate directly with the governor of Tetouan, Sayyida al-Hurra. Though it seems that she herself never boarded ship, she certainly led a maritime force to be reckoned with. The pirate queen’s predations ceased in 1542 under a veil of some mystery. Mernissi speculates that a coup led by one of Sayyida’s sons-in-law overthrew her in that year. It appears that, after 27 years as sole governor of an important Moroccon city-state the lady who took on the mantel of al-Hurra was deposed and to a large degree forgotten. There seems to be no record of her later life or death. 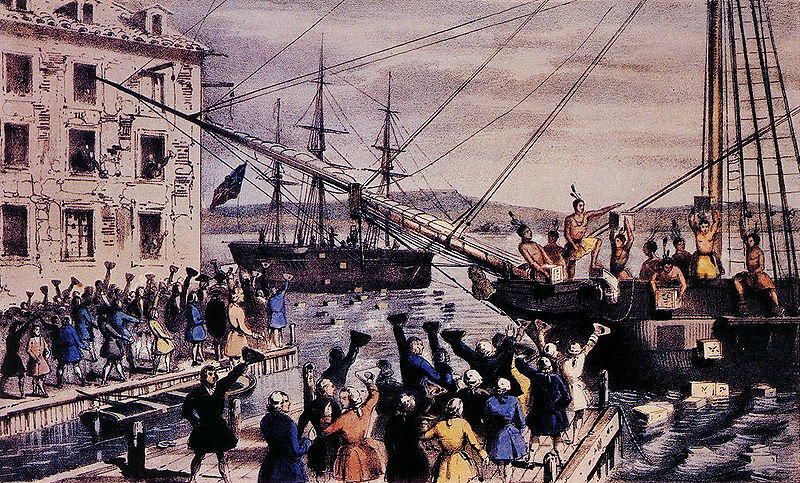 October 16, 1773: In an act of rebellion that would become known as the Boston Tea Party, colonists in Boston dressed up as natives and boarded British merchant ships Eleanor, Beaver and Dartmouth to dump highly taxed tea into Boston Harbor. A long cylindrical piece of timber elevated perpendicularly upon the keel of a ship, to which are attached the yards, the rigging and the sails. He goes on to note that masts may be made of one piece of word, in which case we are dealing with a pole mast. They may also be fashioned of two or three pieces joined together by caps usually of metal; such are termed made masts. Made masts were often the type fashioned at sea when storm or battle had torn a mast away or cracked it in half. The standard masts in a ship of brig or schooner size are a foremast, which is toward the bow of the ship and is only lightly shorter than the mainmast. The mainmast itself is usually just aft of center and is the tallest mast in any ship. In frigate size or larger ships a third mast is added. The mizzen mast is positioned abaft of the main and is usually the shortest mast aboard. Smaller poles can be fitted to any of these masts – but most usually the main and fore – to increase sail. These are put on with a cap and, in order from largest to smallest, are known as the top mast, which attaches to the mainmast proper, the topgallant mast, which attaches to the top mast, and the royal mast, which attaches to the topgallant mast. At this point we are very high up indeed, but true seaman delighted in “skylarking” away aloft. All the Porter seamen, David Senior and Junior, David Farragut and David Dixon spoke of enjoying the high points aboard ship. Horatio Nelson, even after losing his right arm, spent an inordinate amount of time in the rigging and, of course, O’Brian’s Jack Aubrey loved nothing so much as kicking off his boots and climbing right up to the topgallants. A jury mast is one that is, as noted above, set up in place of a damaged or destroyed mast. This phraseology is where our modern term “jury-rigged”, meaning temporary or ill-fitting, comes from. A ship is said to be over-masted or taunt-masted when her masts are too heavy, tall or both for the width and breadth of her keel. Conversely, a ship is under-masted when her masts are too small or short. A rough mast or rough tree is an unfinished spar stowed aboard ship for use as a mast should the need arise. A ship is said to spring a mast when any of her masts cracks horizontally at any point. Mast coats are pieces of canvas fitted snuggly around the mast where it passes through the deck to keep water from leaking down below. Just a quick visual today via the delightful Mid-Century on tumblr. Entitled … blind staggers the picture features – yes – actual booty. And who among us hasn’t faced this crewman’s dilemma: your drunken mate or the dame? I’ll let you decide each for themselves, Brethren; happy Friday! Today marks the official anniversary of the founding of the Continental Navy by an act of the Continental Congress in 1775. 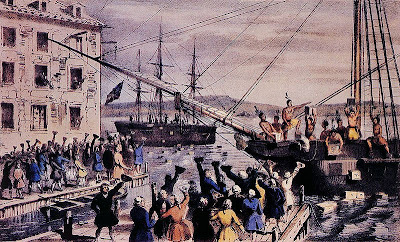 Though the actual establishment by written measures outlining important issues like rank and number of officers, pay scales, ship building/purchase and provisioning did not occur until November, it was on October 13th that the contentious congress, unable it seems to agree thoroughly on anything (sound familiar? ), approved the formation of a navy. This would plant the seed that would flower into the official United States Navy in 1794. While plenty will be written about this anniversary today, the most compelling thing about the Continental Navy for me is that it was established specifically as a privateer fleet. Most of its original ships were thoroughly or in part privately owned and its ranks were entirely volunteer. 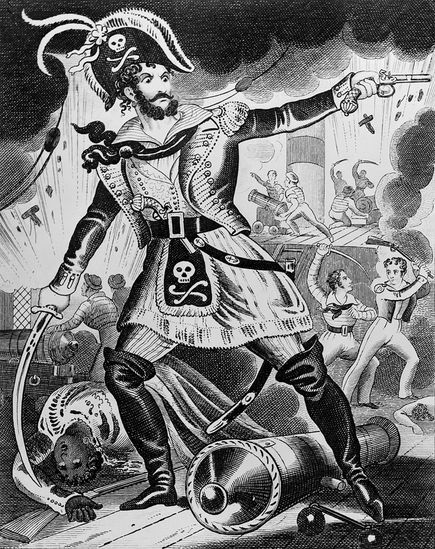 Just like the big dog on the oceans at the time – the Royal Navy – the U.S. Navy spent its infancy as a gang of pirates. Of course the most famous of these raiders, and arguably the most successful, was Scotsman John Paul Jones. Like many colonials, Jones was a bit of a fugitive. He added “Jones” to his name to avoid a charge of murdering a subordinate officer aboard a merchant vessel in commanded prior to the Revolution, and then high-tailed it from the West Indies to Philadelphia. Not only did Jones raid the British coast and her merchant shipping, he managed to take at least two Royal Navy ships: HMS Ranger and HMS Serapis. The capture of these ships by the rebellious colonials was an embarrassment that rankled with the Royal Navy for years to come. Their distress at being bested by the U.S. would lead to a policy of impressments of American sailors and, in turn, the War of 1812. It probably goes without saying that the Continental Navy was made up of small ships. Most were brigs, sloops or schooners that ran fast but could carry a reasonable compliment of men and arms; none were above frigate class. Fortunately for the memory of those who risked their lives at sea to help bring the U.S. into being, we know every ship by name. The list is memorialized online at the Naval Historical Center website; click the names noted in blue for more information about each ship. To paraphrase Dulcie Kennard, the sea may be too impersonal to love but every sailor loves his ship. Since we cannot recall every Continental sailor’s name, let us remember their ships and take a moment to thank them – and those who continue to serve today – for their courage and sacrifice. There’s no question that our seafaring ancestors enjoyed seafood. First it makes perfect sense; if you make your living on the ocean, the availability of seafood is going to be pretty good in most cases. Second, human beings – like most animals – crave foods rich in what their bodies need. High in protein but generally easy to catch, particularly when one is dealing with shellfish and turtle, seafood is also a good source of omega three fatty acids and when cooked in seawater it can replace electrolytes lost through exertion and sweat. Really, a nice seafood stew is a perfect meal for a hard working sailor. New research by a team of anthropologists at Seville University in Spain has turned up evidence that Neanderthals were probably just as fond of a good shellfish as buccaneers. According to this article from telegraph.co.uk, scientists have found evidence of burned mussel shells and barnacles at a site long used as an encampment by Neanderthals in southern Spain. Cueva Bajondillo is on Andalusia’s southern coast not far from the ancient port of Malaga on the Mediterranean, and the remains of shellfish there are a pretty good indicator that the locals were regularly consuming the bounty of the sea. Evidently this is news to modern anthropologists. The article indicates that the finds “provide evidence for the exploitation of coastal resources by Neanderthals at a much earlier time than any of those previously reported…” According to the article, the shells found in Andalusia date back to about 150,000 years ago. This would correspond to similar finds dating to about the same era from the coast of South Africa, making European Neanderthal behavior analogous to early homo sapiens behavior in Africa. Thus it seems that our ancestors, be they homo sapiens, Neanderthal or – as it now appears – a little bit of both, enjoyed a good seafood chowder. And then they passed that appetite on to those who braved the ocean in ships. It’s little things like this that make history so enjoyable. It is Columbus Day here in the U.S. which, even when I was a kid back when we actually celebrated Lincoln and Washington on separate days, had and still has very little meaning. I don’t think we get mail today, right? Anyway, this is the kind of day you wish you were Canadian; happy Thanksgiving to all you all. Columbus has fallen on hard times in the opinion polls, as I’m sure we’re all aware. When I was young he was an important explorer; now he’s been denigrated to meddling mass murderer – weapon of choice: syphilis. My Dad was a member of the Knights of Columbus; now that Catholic confraternity just calls themselves “Knights”. Lo, how the mighty have fallen. Two recent books argue that explorers Christopher Columbus and Vasco da Gama were more like Christian crusaders than greedy mercenaries or curious adventurers. First off, awesome overuse of adjectives there and then second, are all those things really mutually exclusive? 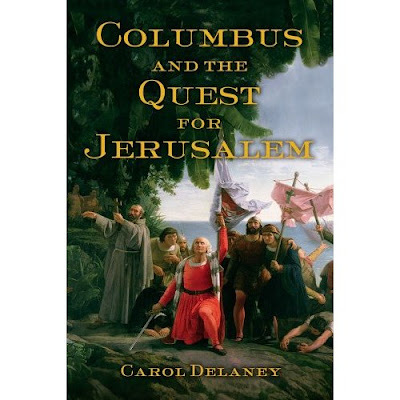 Couldn’t we reasonably say that Columbus was greedy for glory and sought it as an adventurer, tacking his Catholic faith on when his zeal for notoriety didn’t quite live up to his expectations? As far as Carol Delaney is concerned, the answer to that question must be no. In her book Columbus and the Quest for Jerusalem she posits that Columbus was seeking wealth in India to fund a Crusade against the Muslims, thus taking back the Holy Land for Christendom and, I gather, setting the stage for the second coming of Christ. I am not making that up. If all that doesn’t make you too dizzy to read more, the other book discussed in the article is even more to the same point. Entitled Holy War and written by “… British writer and amateur historian” Nigel Cliff, this book basically says the same thing about Vasco da Gama. 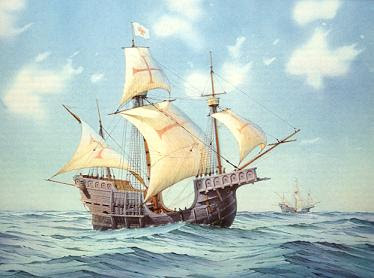 Da Gama, a contemporary of Columbus, sailed around Africa to actually get to India; something Columbus never managed. … mere economic advantage wasn’t a medieval concept. Reread that if you need to and then let’s break it down. Both Portugal and Spain – just like all their European neighbors – were busy growing a burgeoning merchant class at the end of the 15th century. Wars had emptied royal coffers all over the continent and every head of state, having tasted the wealth of the East during the actual Crusades, wanted more, more, more. Nationalism had become a viable commodity by 1492 and, like the Cold War arms race, the rush to acquire new lands and the gold they held was on. To discount economic advantage as the springboard for the Age of Exploration is tantamount to saying pirates didn’t really want loot, they just liked to risk their own lives. If you are taking refuge from another discipline in the belief that history is easy, without bothering to do the basic work… you will deserve to fail. And that’s Jenga as far as I’m concerned. Columbus was a glory hound and – worst of all in my opinion – a very poor sailor. It’s hard to imagine that a man so caught up in his own existence would trouble himself to be passionately anti-Islam. If you’d like to see what he was thinking in his own words, you can peruse Columbus’ journals at Fordham University’s website. With that, Happy Columbus Day and best of luck to Cliff and Delaney; that said, I won’t be reading their offerings any time soon. There are more pirates to research, after all. This day our noble Captain feasted the officers of his small squadron with four dishes of meat, viz. four excellent hens and a piece of pork boiled in a dish; a gigget of excellent mutton and turnips; a piece of beef of eight ribs, well seasoned and roasted; and a couple of very fat green geese; last of all a great Cheshire cheese; a rare feast at shore. We've discussed, on numerous occasions, that a life aboard a sailing ship is a life of endless work. From officers to boys, from men to women, from dogs to cats and the occasional monkey or sloth, there is always something to do that looks just like work. But how was the word used in the Great Age of Sail? I am so glad you asked. The days work was measured, not from sun up to sun down as by land, but from noon to noon. “Calling noon” meant the beginning of a new day aboard ship and the phrase “the days’ work” became so much associated with that time-honored tradition that marking the dead-reckoning and meridian altitude at noon became known as the days work. Working an observation was the art of divining the altitudes and distances of planets and stars so as to calculate course. Similarly, working a lunar is reducing the observation of the sun and moon or the moon and stars to divine longitude. This is also a colloquialism for a man not listening or literally falling asleep while another speaks – frequently used by land, one imagines, with regard to wives and sweethearts. A crew is said to work their ship by adjusting sails and rigging to the direction and force of the wind in relation to desired destination. A ship is said to work when she groans and strains in a heavy sea. The sound of her joints loosening is both desirous in new ships and terrible in old. Working double tides indicates doing the hard work of three days in the span of two or two tides’ worth of work from noon to noon. Working parties were groups of hands given errands to run or work to do away from the ship when in harbor. These were the gangs that only trusted hands could be assigned to as desertion was very much an option when a man was out with one. Meanwhile, back at the ship, greener hands may be put to working up junk, the mind-numbing task of pulling apart old ropes to use for caulking, starting the galley fire or making new rope. Working up is the senseless and sometimes merciless habit of some martinet captains to keep men working beyond their usual hours as a punishment. Such tactics have led to bloody mutiny as in the notorious case of HMS Hermione. Finally a ship is said to be working to windward when she is sailing against the wind by tacking. This is also known as beating to windward or beating up. A fair Saturday to one and all; I’ll spy ye tomorrow for Seafaring Sunday. 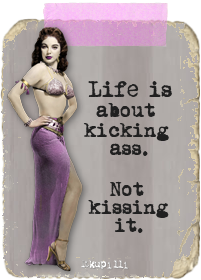 It is Friday at last and frankly, for me anyway, none too soon. In the spirit of what is in the offing – even the French, so fussy about their language, call the upcoming two days le weekend – I would like to offer a little humor before we plunge into a little relaxation. This Cracked article entitled, appropriately enough, The 10 Greatest Uses of Trash Talk in the History of War, is both amusing and instructive. The quotes all have a decided ring to them and are, I think, appropriate for more than just the situations in which they were originally used. From Jeanne d’Arc’s impeccable “The Maid is willing that you… not destroy yourself” (just insert your name in place of “The Maid”) to Pierre Jacques Etienne Cambronne’s simple but unequivocal “Merde!”, you really can’t go wrong with any of these. As a side note before I continue, it must have been tooth-grindingly difficult for the Cracked writers, normally so full of “the best thing the French do in a fight is run away” canards, to, of necessity, include so many French warriors on this list. Anyway, tucked in the middle of the pack are two incredible American seamen whose words should be memorialized by the citizens of their grateful country. The other sailor on the list is Oliver Hazard Perry, the hero of the Battle of Lake Erie whose personal flag read “Don’t give up the ship”. Perry stated before the battle that “If a victory is to be gained, I will gain it”. As the article notes, he meant it. After defeating the premier navy in the world in their own back yard – Canada – Perry sent word to U.S. General and future President William Henry Harrison in one simple sentence: “We have met the enemy, and they are ours.” As the article notes, it is unfortunate that more credit is not given to Perry and his contemporaries now. Educators in the U.S. instead choose to ignore or denigrate every victory achieved by our ancestors during the War of 1812; a war that thinking people understand as our Second War for Independence. But I’ve said too much all ready. 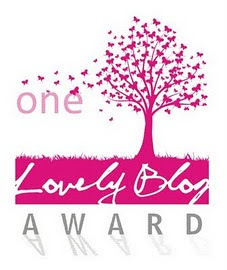 Pop over to Cracked and enjoy a thought provoking giggle; it will be well worth your time. Be sure and stop in tomorrow for another round of Sailor Mouth Saturday. 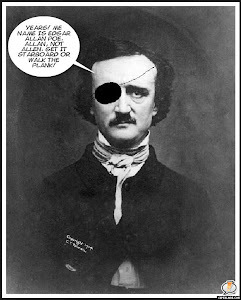 And if you have a chance before then, visit my dear friend Undine’s The World of Edgar Allan Poe for a heartfelt and thoughtful tribute to the genius, who died on this day in 1849. Over at the always thought provoking Live Science online, an article about “real pirates of the Caribbean” has some interesting insights into a little-discussed area of piratical life: time by land. Though much has been written about “famous” pirate haunts like New Providence, Madagascar and most especially Jamaica’s Port Royal, scholarly commentary on other less developed pirate settlements is not readily available. The article focuses on the archaeological findings from a circa 1720 encampment of pirates known as Barcadares. Located in modern Belize on the Belize River about fifteen miles inland from the Gulf of Mexico, the place seems to have been chosen by men of various nationalities as a logwood cutting site. The logwood trade, begun during the age of the buccaneers and continuing well into the 18th century, was an illegal operation that plundered logwood from Spanish territories for shipment to English, French and Dutch islands in the West Indies. The wood was used for building and to make expensive dyes, and more than one freebooter subsidized his time at sea by working in these covert encampments. Excavation at the site was begun in the 1990s by archaeologist Daniel Finamore and the artifacts he and his team uncovered have been analyzed by Heather Hatch of Texas A & M. Ms. Hatch’s findings were recently published in The Archaeology of Maritime Landscapes. According to her, the Barcadares is “… the only clearly pirate-associated site from this period excavated to date” making it, of course, a source of real interest for historians of both nautical and pirate life. Unfortunately, the veracity of that statement is suspect given the current and ongoing projects both above and below water in and around the Bahamas and North Carolina, just to name a few. The specifics detailed in the article also raise some serious red flags about the analysis as a whole. [The men of the logwood camps’] chief delight is in drinking; and when they broach a quarter cask or a hogshead of Bottle Ale or Cyder, keeping at it sometimes a week together, drinking fill they fall asleep; and as soon as they awake at it again, without stirring off the place. This rings uniformly true from research done by various authorities from Benerson Little to Stephen Talty and beyond. The logwood trade was sporadic, with cutting done at certain times followed by loading onto vessels. The wood was usually paid for in trade with necessities, provisions and especially alcohol. A good sale would be followed by a long bout of drinking. When the liquor was gone, the whole process would start over again. The finds of pottery and in particular delftware and some Chinese porcelain lead Ms. Hatch to believe that the men of the logwood camp were using goods captured from merchant ships for their daily meals. She compares this fine tableware to the more workaday items found in two sites on the island of Nevis dating from the same period and posits that the pirates were eating communally, mostly from bowls, but trying to give themselves an air of sophistication. While it is not mentioned anywhere in the article, I feel it is important to note that the sites on Nevis were both centers of sugar production and shipping. These would have been areas were a high concentration of slaves lived and worked. Certainly this does not negate the comparison, but it does raise questions not addressed in the article. Free men, no matter how mean their situation, may do as they please; slaves must eat from the plates and bowls they are given. I would counter here that the men of the logwood camp were simply using what was available to them and that happened to be “nice” china possibly taken during offshore raiding or given to them as payment. It’s hard to imagine men eking out a living in a mosquito invested swamp putting on much in the way of airs. Pipes make up 36 percent of the artifacts found at the pirate site, compared with 22 percent at the Ridge Complex [a sugar mill and related dwellings on Nevis] and 16 percent at Port St. George [a sugar processing and transport site on Nevis]. They’re not going to be sword fighting all the time… There’s a lot of down time when you’re a pirate, when you’re sitting around in your ship, when you’re waiting for prey, waiting for someone to attack or when you’re sailing from point A to point B. She goes on to say that pirate crews were large and postulates the “many hands make light work” theory of sailing in such a case. Smoking tobacco was a luxury done mainly ashore. With the uncertainty of wind and wave, tobacco aboard whip was chewed unless one owned a covered pipe. Clay pipes were the most commonly smoked… [and they] had one drawback: the bowl had to cool after each smoke. As Ms. Selinger notes, smokers would keep several pipes and use them interchangeably. The ends would be snipped off periodically and eventually the pipe would be discarded. Excavations at Port Royal have turned up thousands of clay bowls from 66 different manufacturers. Once again, we have an issue of convenience. The finding of more pipes as artifacts does not necessarily indicated heavier day-to-day habits, just more leisure time and most probably more access to convenience in the form of numerous clay pipes. The whole article was a bit puzzling to me as it feels like a lot of things, both physical and historical, about this site need further exploration. I’m hoping that more experts will take a look at the fascinating artifacts that have turned up at Barcadares. There is certainly a story there, but it seems that it has not yet even begun to be told. It goes without saying that a sailing ship lives and dies by the wind. A dead calm can be as deadly as a hurricane if the conditions are right – or wrong as the case may be. 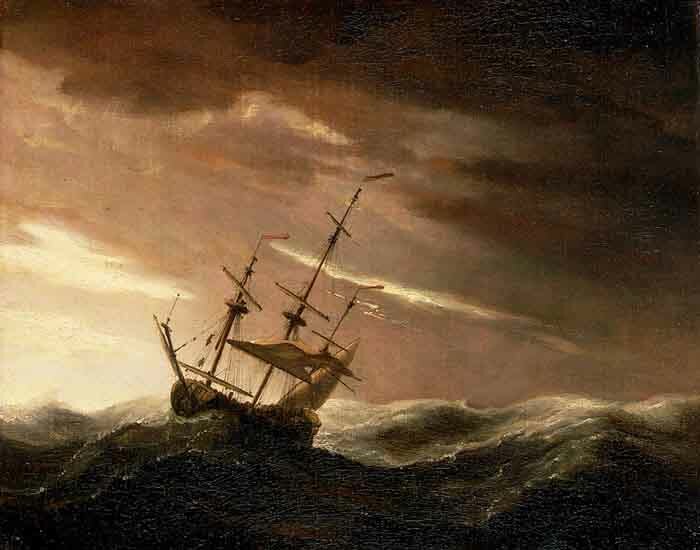 Knowing the general velocity of wind, as well as myriad other factors of weather and position, can keep ship and men safe in even the most trying of circumstances. Smoke rises vertically, undisturbed – the wind is calm, blowing less than 1 knot. Smoke drifts toward horizontal – light airs, 1 to 3 knots. A man feels the wind on his skin – slight breeze, 4 to 6 knots. A light flag or pendant extends from a staff or yard – gentle breeze, 7 to 10 knots. Wind raises light, loose items on deck such as dust, ash, paper – moderate breeze, 11 to 16 knots. A standard flag snaps briskly – fresh breeze, 17 to 21 knots (under good way with steering room, this is certainly the sailor’s favorite condition for making time). 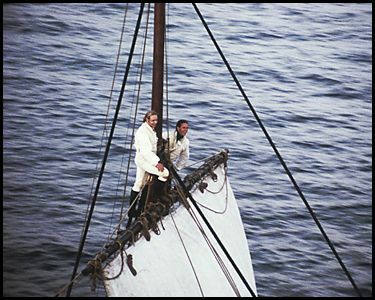 Wind is heard to whistle through the rigging – strong breeze, 22 to 27 knots. 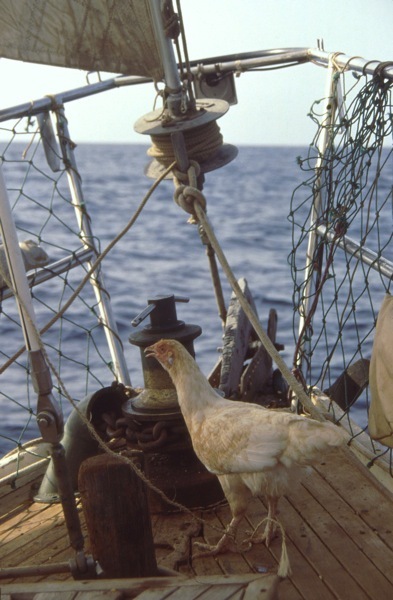 Up on deck, particularly on the quarter or poop, walking against the wind is difficult – moderate gale, 23 to 33 knots. The insistence of the wind actually impedes the ship’s progress – fresh gale, 34 to 40 knots. With this last and any wind strength thereafter, finding safe anchorage or taking open ocean precautions becomes imperative. Note that a hurricane force wind in this period was defined as anything over 65 knots in velocity. 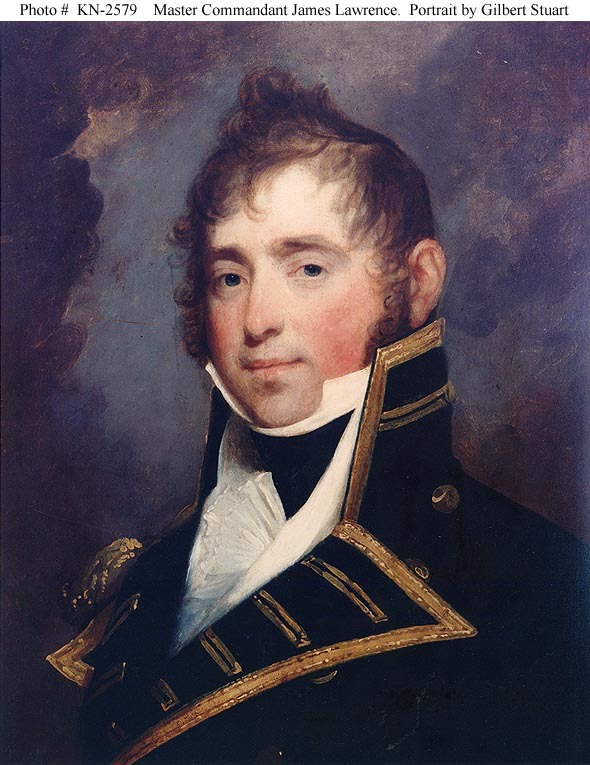 October 1st was the 230th anniversary of the birth of Captain James Lawrence, USN. Lawrence, whose famous urging to his crewmen “Don’t give up the ship” has been a Navy rallying cry since he spoke those fateful words, is unfortunately not as famous as his utterance. Though he died young at only 31 years of age, Lawrence had as impressive a career as far more noted naval heroes of his time. Lawrence was born during the Revolutionary War. His mother, Martha, was apparently a supporter of the rebellious colonies in which she lived. 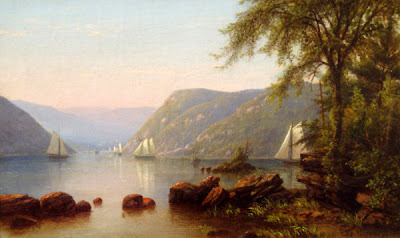 Her husband, John, had Loyalist leanings to the point of preparing to move his family from Burlington, New Jersey to Nova Scotia. Martha died shortly after James’ birth and John, apparently not the steadfast type that his son would grow into, left the infant with his half-sister and fled to Canada. Father and son would never meet face to face. James grew up in Woodbury with his aunt’s family, not knowing until later that he was not one of the clan. Though he had begun to study law in his early teens, James took a sudden inclination to go to sea and joined the newly rebuilding U.S. Navy as a Midshipman in 1798. The Quasi-War with France was in the offing, and James had plenty of opportunity to show his aptitude for sailing. He was first placed aboard the brig USS Ganges and then transferred to the frigate USS John Adams. His capabilities brought him a Lieutenant’s commission in 1802, just in time for the First Barbary War. Lawrence was aboard USS Enterprise as Second Lieutenant when USS Philadelphia was captured by the Tripolitans. The timing was perfect; James distinguished himself as second in command under Stephen Decatur in the daring raid that destroyed Philadelphia in Tripoli harbor in 1804. The following year he would command Gunboat No. 6 on a political mission to Italy and then take up the position of First Lieutenant aboard John Adams. With the First Barbary War over, Lawrence – still with the rank of Lieutenant – took command of first the sloop Vixen and then Wasp. By 1807 he was back home in the U.S. in the port of New York. It was probably during this period by land that young James Lawrence met the daughter of a French merchant in the city, Julia Montaudevert. She was only seven years younger than Lawrence and, in fact, a virtual old maid by the standards of the day at nineteen years old. She was said to have a quiet charm and beautiful dark eyes. Lieutenant Lawrence was smitten; the pair married in 1808. Lawrence was promoted to Master Commandant while in command of the brig Argus late in 1810. At this time he was given command of the sloop Hornet, a fast runner who carried a remarkable armament for her size. Lawrence was immediately dispatched “… to Europe on a diplomatic mission” according to his biography at the Naval History Center website. They do not say what the diplomatic mission concerned, however. With the onset of the War of 1812, Lawrence took Hornet all over the Atlantic to hunt for British ships. He captured the privateers Dolphin and Bonne Citoyenne in 1812, following up with the capture of HMS Peacock in 1813. When he returned to Boston with his prize in March of the same year, Lawrence found himself promoted to Captain and put in command of one of the finest ships in the U.S. service, Chesapeake. He also found he was a father when Julia presented him with their nearly two year old daughter Mary Neill Lawrence. James had precious little time to spend with his new family. His orders as Captain of Chesapeake were to approach and engage HMS Shannon. 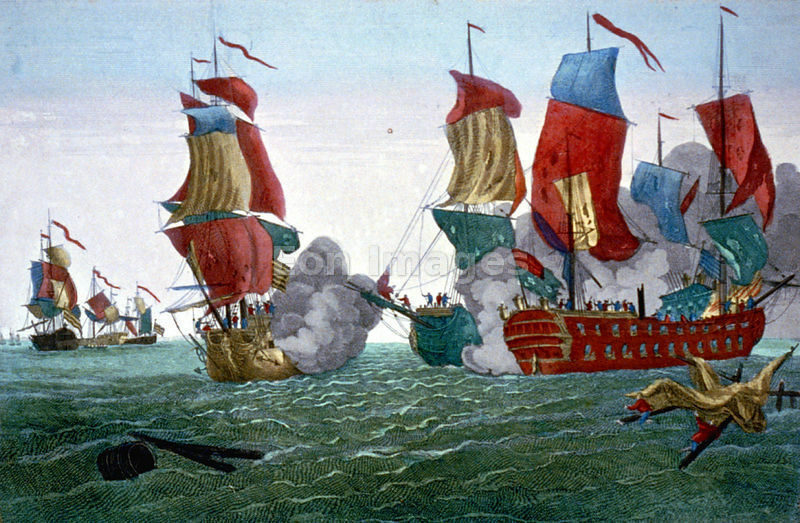 Captained by the veteran Philip Bowes Vere Broke, Shannon had been blockading Boston harbor with great success. Lawrence took Chesapeake out on June 1, 1813. Unknown to him, Julia was again with child when he sailed. Lawrence engaged Vere Broke almost immediately upon getting underway. Chesapeake and Shannon began firing at 4:00 PM and Vere Broke’s highly trained crew got the upper hand almost immediately. All of Chesapeake’s officers were either wounded or killed. 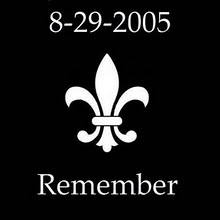 Captain James Lawrence was struck several times by sniper fire. As men picked him up from the deck to carry him below, he shouted: “Tell them to fire faster; don’t give up the ship!” Some sources give the quote as: “Don’t give up the ship! Fight her till she sinks!” Either way, Chesapeake would only fight for a quarter of an hour; Shannon’s angry boarding party overwhelmed her only minutes after Lawrence expired. Chesapeake was taken as prize to Halifax, Nova Scotia where Lawrence and his officers were laid to rest with honors. The news of Chesapeake’s defeat cheered the British, who had suffered – and continued to suffer – heavy losses at sea against the Americans. Paroled Chesapeakes brought the news of Lawrence’s brave last words home. His close friend and colleague, Oliver Hazard Perry, had a blue flag made with white lettering proclaiming “Don’t give up the ship”. This he flew on his flagship during his victory at the Battle of Lake Erie in September of 1813. A replica of the flag is now on display in the Naval Academy at Annapolis. Julia Lawrence gave birth to her son James after his father’s death. The boy died in infancy. Mary Neill Lawrence went on to marry another naval officer in 1838, William Preston Griffin. Julia successfully had her husband’s remains transferred to New York. 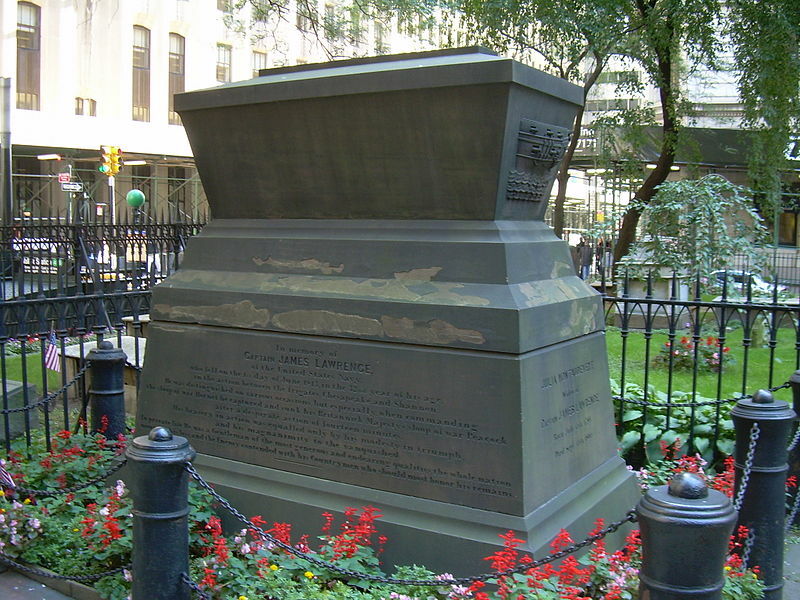 The Lawrences are now interred in Trinity Churchyard in Manhattan. 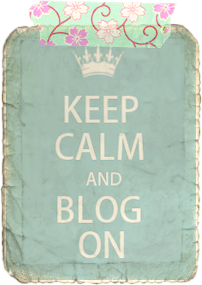 Seafaring Sunday: "Don't Give Up the Ship!" October 1, 1781: James Lawrence, USN who, when mortally wounded while in command of USS Chesapeake during the War of 1812, urged his crew: "Don't give up the ship!" is born in Burlington, New Jersey. The word by at sea generally refers to the status of a ship or to what the ship is doing. As happens so often with “sailor speak”, it also leads us to common phrases used today that originated on wave. A ship is said to be sailing by the head when she is, either by her nature or by the way her cargo and/or ballast is stowed, deeper fore than aft. Conversely, she is by the stern when she is deeper by the aft. 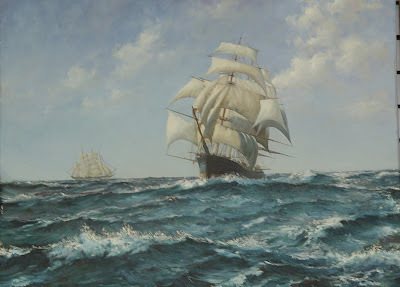 By the lee, a not uncommon term that has carried over into the modern ship’s vernacular, indicates a ship or boat sailing free due to having been quite literally taken aback by a shift of wind, so that the breeze is now at her stern. This situation can occur either as noted, through a shift of wind, or through poor seamanship. In the latter reference, the term was used in the early 19th century to indicate that someone was flabbergasted or at a loss for words. In O’Brian’s HMS Surprise, Stephen Maturin – recovering from being tortured by the French – asks Jack Aubrey’s coxswain Barret Bonden to write a letter for him. When Bonden does not respond, but stands staring open-mouthed at the doctor, Stephen says: “Why Bonden, have I brought you by the lee?” Of course it comes to light that Bonden does not have his letters, and Stephen undertakes to teach him to read. In general terms, within six points; or the axis of the ship is 67 ½ degrees from, the direction of the wind. This may be the origin of our modern “by and large” meaning generally or in most cases. So we shall end for today but not before a shout out to the Navy football team who nearly beat Air Force earlier today. Good game, Mids; fairer sailing next time.